Is your scalp itchy and flaky after shampooing? If so, then part of the blame can often be placed on Sodium Lauryl Sulfate (SLS). 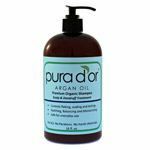 In many cases a sulfate free dandruff shampoo such as Pura d’or or Sage Shampoo can alleviate the problem. These brands are certainly worth trying if conventional dandruff shampoo’s are not helping with your dandruff problem. Pura d’or Anti-Dandruff Shampoo is our number one recommended anti-dandruff brand. It does a fantastic job at fighting flaking and itching. It’s safe enough to use daily and it’s safe for all hair types. Many customers state that they have no use for conditioners anymore because this product does it all. Pura d’or also offers a 100% satisfaction guarantee. At an affordable price, there is no reason not to try this product if you have dandruff. Tree to Tub Lavender Shampoo is the only liquid shampoo that is pH balanced. The main ingredient in this shampoo is also unique. The main ingredient is wild soapberry, which is naturally harvested in Taiwan. Soapberry creates a natural lather and it has anti-bacterial and anti-inflammatory properties. This product is expensive but it’s well worth the price if you can afford it. Tree to Tub’s lavender shampoo is free of harsh chemicals and it will leave your hair and scalp looking great. Here is a good shampoo bar that is able to help fight dandruff. 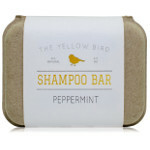 Made in the USA, The Yellow Bird’s Peppermint Shampoo Bar is a gentle option that is able to clean your hair and not strip it. The ingredients include: organic coconut oil, argan oil, peppermint essential oil, and jojoba oil among others. Like most shampoo bars, this one is eco-friendly. It contains all-natural ingredients and no-plastics. By using this brand you can help save the environment and help your dandruff condition all at the same time. Jason is a popular brand that people trust and for good reason— they have been producing high-quality products for a long time. 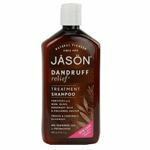 Jason Dandruff Shampoo uses natural botanicals and aroma-therapeutic essential oils to control dandruff and heal your scalp. There are a lot of positive reviews about its effectiveness. The price is affordable so it’s definitely one brand to consider. Most shampoos use Sodium Lauryl Sulfate (SLS) as a foaming/detergent agent because it’s cheap. Some people feel no effects at all, but many people do acquire sensitivities to SLS, and many times don’t even know the reason why. Now that you have a little background on the subject, let’s take a closer look at some of the ingredients that are in SLS free dandruff shampoos. What’s the Replacement for SLS? Since there is no natural ingredient that replaces SLS, people have become used to the lathery foam that SLS produces. When they first use a sulfate free product they feel that the lack of foam means their hair isn’t at its cleanest, but this simply isn’t true. You can certainly have clean hair without foam. Emollients stay with the hair follicle, which makes your hair soft and manageable. You can read more on SLS Alternatives here. Choosing one product over another is a matter of personal preference. And to be fair, people with thick hair, thin hair, or in the case of heavy dandruff, the manufacturer will focus on ingredients such as zinc pyrithione to address the needs of their target market. What does this mean for you? 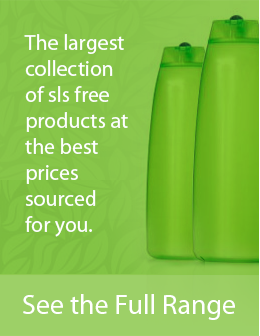 Even in the world of SLS free shampoos you may have to buy a few different products before you find the one that works best for you. People who have switched to SLS free dandruff shampoos have been more than happy with the results. The fact that you can solve your dandruff problems, while doing it with products that use non-toxic ingredients, makes you feel much better. If you’re still fighting with dandruff, consider trialing one of the products on our list. Many of those with persistent dandruff experience immediate results when making the switch to sulfate free shampoo. You’re going to use shampoo anyways so may as well go with a natural anti-dandruff brand. So give one of the products above a try!